Three-dimensional (3D) high resolution magnetic resonance (MR) scans of the lumbar spine provide relevant diagnostic information for lumbar intervertebral disc related disorders. Automated segmentation algorithms, such as active shape modelling, have the potential to facilitate the processing of the complex 3D MR data. An active shape model employs prior anatomical information about the segmented shapes that is typically described by standard principle component analysis. In this study, performance of this traditional statistical shape model was compared to that of a multi-level statistical shape model, incorporating the hierarchical structure of the spine. The mean Dice score coefficient, mean absolute square distance and Hausdorff distance obtained with the multi-level model were significantly better than those obtained with the traditional shape model. 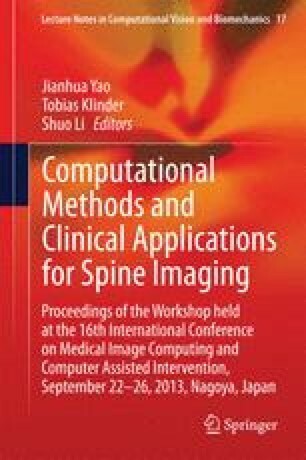 These initial results warrant further investigation of potential benefits that the multi-level statistical shape models can have in spine image analysis. The authors would like to thank Dr. Duncan Walker for the radiological assessments. This research was supported under Australian Research Council’s linkage project funding scheme LP100200422.